So here is a new version of the popular snake game, adding a new way to control and completely breaking with the classical moving only horizontally or vertically. Just touch the screen and the snake will follow your finger. If you have played Minesweeper or Sudoku from Microsoft on your Windows Phone then you can see how the main menu is similar. 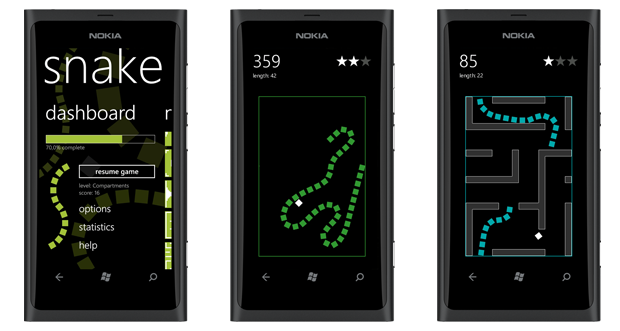 The game follows the Modern UI Style principles, uses your accent color and even background color. There are 30 different levels, and you can adjust the speed of the game in options. The game is completely free. Enjoy!